EXTRATERRESTRIAL life may exist on at least three planets in a newly discovered solar system just 39 light years from Earth, scientists believe. 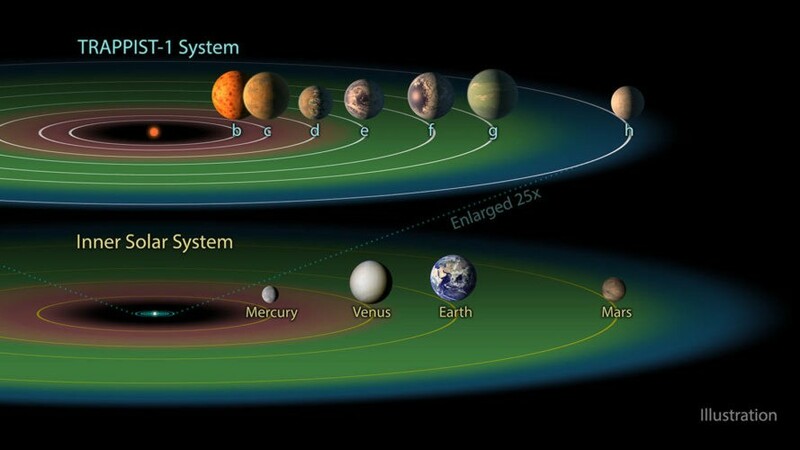 A team of international astronomers, co-led by British scientist Dr Chris Copperwheat, detected seven Earth-sized worlds orbiting a cool dwarf star called TRAPPIST-1. The six inner planets lie in a temperate zone capable of supporting life and at least three may have oceans - where life began on Earth. A robotic telescope operated by Liverpool John Moores University played a major role in the discovery, first reported in the journal Nature. The Liverpool telescope supported observations made by Nasa's Earth-orbiting Spitzer telescope and helped detect the planets as they passed in front of their star. Dr Copperwheat said: “As a robotic telescope and the largest in the world, the Liverpool telescope is very sensitive to the small, less-than-1 per cent dips in brightness through which the planets are discovered. The planets were found using the “transit” method that looks for tiny amounts of dimming caused by a world blocking light from its star. The Liverpool telescope is located on La Palma in the Canary Islands.